There are healthy things that we can do each and every day to live a longer life. The same holds true with our pets. Through proper vet care for cats and dogs, New Bedford pet owners have the opportunity to help keep their furry friends around for many years longer than domesticated pets once lived. These tips from Anchor Animal Hospital in Dartmouth are designed to help you improve the daily care, feeding and nurturing that you can provide to your dog to help add years to his life. For more tips, call or visit our Dartmouth vet hospital and speak with one of our highly trained and knowledgeable veterinarians. 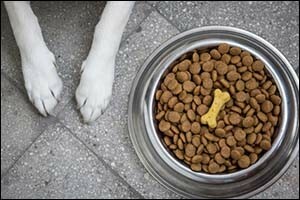 Most of us go through life thinking that all dog foods are created equal. We either buy the same brand that our parents bought for our dogs when we were kids, recognizing the brand symbol on the bag, or we buy the cheapest or most human-appealing food on the market. The definition of human-appealing food is kibble that is packaged in a certain way, has a certain smell, or features marketing and branding that appeals to us. Dogs don’t care about any of these things, they pretty much eat whatever we give them, so it is important to look at the nutritional value of the food that we select in order to provide our dogs with the best nutrition available. A high quality diet will provide your dog with bright eyes, healthy skin and a shiny coat. Good diets are responsible for maintaining intestinal health, increasing or maintaining mental acuity, keeping muscles healthy, strengthening immune systems and taking care of joints as your pet ages. If you aren’t sure what type of dog food is best for your pet, make sure to speak with a veterinarian at our animal hospital in Dartmouth for some essential advice. Protein, calories, additives, preservatives, and ingredients are “hot buttons” in the dog food world, but it is important to get real advice from a professional to get the best food for your dog based on his breed, size, age and lifestyle. Dogs that are too thin or too large can have underlying health issues that can cause problems as they age. If your dog is underweight you should consult with your veterinarian at the Dartmouth vet hospital to find out what is causing the weight issue and what you can do to safely increase your dog’s weight. Don’t start feeding human food or just increasing calories without getting a proper consultation. Dogs that are overweight will also need professional help in reducing calories. It is important to reduce caloric intake without sacrificing nutrition. In some cases, lifestyle is to blame for overweight dogs. Try increasing your dog’s activity with daily walks or playtime on weekends to get them more active. Studies show that a dog’s life can be reduced by as much as two years just for being overweight. They are with us only just a few short years, so we should do everything in our power to get vet care for cats and dogs that will ensure that they get the very most out of their lives. Overweight issues can lead to joint disease, diabetes and heart disease, as well as other problems that can significantly reduce quality of life and the time we get to spend with our pets. Another great way to keep your pet healthy is to bring them to the local Dartmouth vet hospital regularly for check-ups. What is regularly? Well this depends on your pet, the age of your pet, the health quality of your pet, and the lifestyle of your pet. Anchor Animal Hospital in Dartmouth recommends yearly check-ups for young dogs, but New Bedford pet owners should bring senior or ailing dogs in for a regular check-up at least twice a year or more frequently, depending on their unique situation. Consult with your veterinarian for the best tips regarding check-ups and vet care for cats and dogs to maintain a healthy lifestyle and increase their longevity. Another area where many New Bedford pet owners overlook with regard to their pets is good dental care. Some pets are great at allowing their owners to brush their teeth or they will willingly take a dental care bone once a week to keep their teeth clean. However, some dogs need more oral health care and others won’t allow their owners to do a thing for them. If that sounds like your situation, you should consult with the animal hospital in Dartmouth about vet care for cats and dogs that includes dental care for better oral health. Dental disease and other related issues can cause your pet pain, which can make it difficult for them to eat or drink. When left untreated, many oral health problems can result in other types of diseases that can be fatal, including kidney and heart disease. Dental care should be part of your daily routine at home through the use of brushing, dental positive diets, dental treats and even special toys designed to improve your dog’s dental care. Visit your Dartmouth vet hospital for professional cleanings and assessments of your pet’s oral health care. For more tips on pet safety and health advice for New Bedford pet owners and pet owners in the South Coast area, visit our Dartmouth vet hospital for regular check-ups, emergency care, evaluations and other types of vet care for cats and dogs, pocket pets, exotic pets and other animals. Give us a call at 508-996-3731 to set an appointment or to learn more about our services.